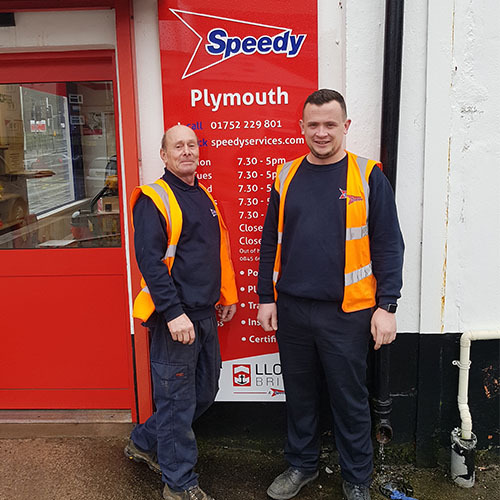 It’s not every day you find yourself performing first aid at a Speedy depot, but for the team at Plymouth that’s just what happened when their Speedy first aid training saved a man’s life. A man was visiting a newsagent next to the Plymouth depot to pick up his weekly lottery ticket and walk his dog, when he suffered a heart attack in the shop. The owner, in need of help, ran to the depot to ask for help. The Plymouth team rushed into action, immediately putting their Speedy training to use. The gentleman had turned blue and was not breathing when the team arrived. Quick to respond, Engineer Dave turned him into the correct position and held his head steady as Lewis, the Assistant Manager, promptly provided CPR. Meanwhile, their colleague Shane cared for the man’s dog, which was noticeably alarmed, until his wife arrived onto the scene. The emergency response paramedics came 15 minutes later, asking Lewis to continue performing CPR whilst their defibrillator was set up. After a harrowing 30 minutes, the man began to breathe again. As some colour returned to his face, the paramedics swiftly took him in an ambulance to the hospital. By springing into action and keeping a cool head, the team at Plymouth had used their Speedy first aid training from 18 months earlier to save the life of a man. Speedy offers life-saving first aid training to all colleagues, and we are all immensely proud of the team at the Plymouth depot for calmly and effectively using their training to go above and beyond to save another person’s life.